The night of January 20/21 in Rovaniemi was a night of odd radius halos. 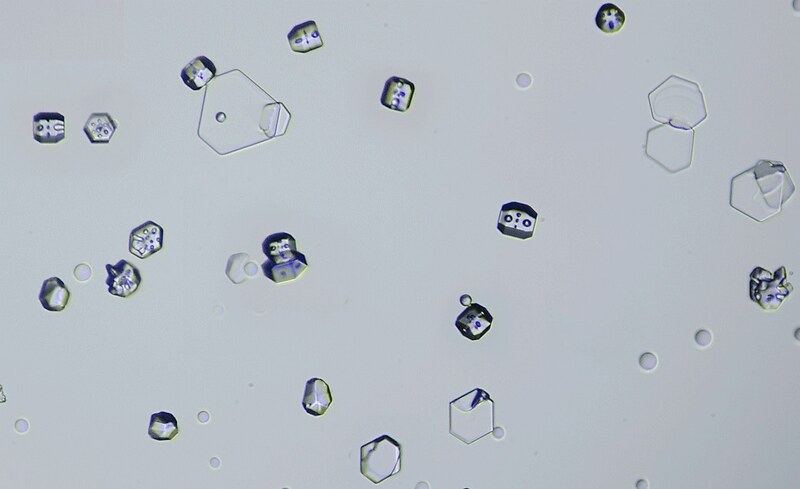 Here are shown mostly crystals collected during a half hour period. At the same time photos were taken continuously in the spotlight beam, below is one of those stacks. The sample contained plenty of traditional type pyramids – something we have not yet seen this winter. So it is curious that odd radius halos are not conspicuous in the beam photos and at times even completely absent. Maybe the abundant cavities in the crystals caused too much disturbance. The stack is from a stage where the odd radius stuff was at its best, taken towards the end of the crystal collecting period. Visible are 9°, 18° and 35° halos. The temperature during the night was around -33° C.
This entry was posted in artificial light source halos, diamond dust halos, ice crystals, pyramidal halos and tagged odd radius halos. Bookmark the permalink.